Elsafur: un universo colorato, dinamico, ricercato. 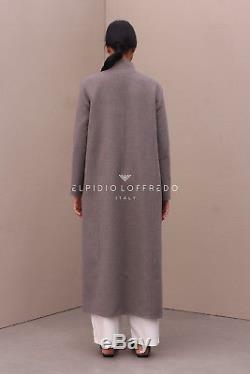 Cappotto di Cashmere con smanicato in zibellino, lavorato a pelli intere. Valore di mercato: 38.000,00 Pelliccia di altissima qualità, versatile ed elegante allo stesso tempo. DETTAGLI: - Altezza modella 180 cm (senza scarpe); - Taglia modella: 40 (taglia italiana); - Colore: Taupe; - Collo Rotondo; - Interno: Cashmere; - Taglio tasca verticale nascosto; - Chiusura con gancetti - bottone automatico; - Lunghezza manica Full; - Stile: Comodo; - Consigli della nostra Stylist: indossalo con un abito elegante. Taglia italiana: 42 (disponibili: Realizzabile in tutte le taglie) Misure. 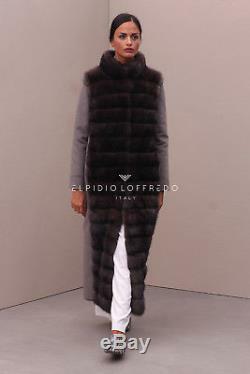 A: - (altezza capo) C: - D: - E: - F: - M. Elsafur is the online store which offers vast variety of fur and leather products that are entirely designed and crafted in Italy. Excellent quality, elegant design, respect for tradition inspire Elsafur to create collections that will satisfy the demands of most chic and sophisticated women. 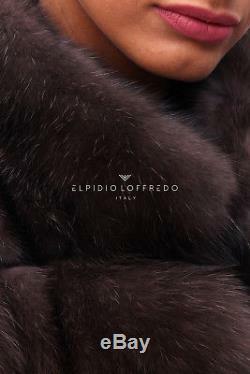 Elsafur is a young company that is committed to bring Made in Italy mark to the world using carefully selected skins and furs to ensure high quality standards and compliance with the rules of the governing sector. 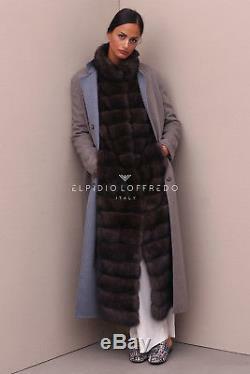 Elpidio and Salvatore Loffredo, two young entrepreneurs, who inherited their passion from the family of artisan furriers, are the moving force of the company! Balanced combination of the ancient tradition, innovation technologies and modern style make Elsafur unique, colorful and dinamic! Elsafur pays particularly close attention to the compliance with the international standards on protection of animals by purchasing fine quality furs of its hides only from certified suppliers and carefully following the regulation in terms of environmental sustainability. Elsafur is a dinamic, diverse and colorful universe! 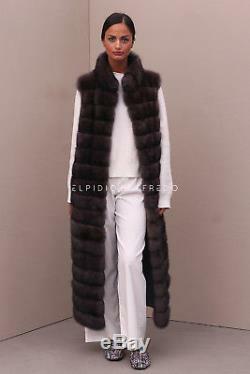 Cashmere Coat with sable sleeveless, whole skins. 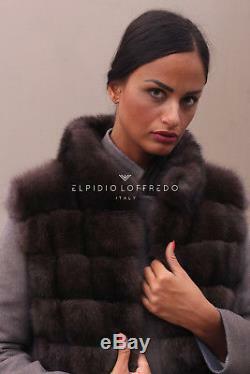 Value of market: 38.000,00 Fur of the highest quality, versatile and elegant together. 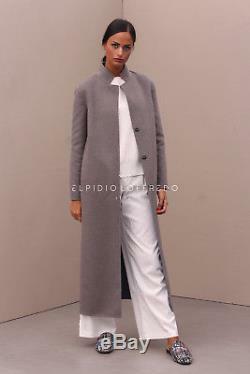 TO KNOW MORE: - Height model: 180 cm (without hills); - Size Model: 40 (Italian size); - Color: Taupe; - Vertical pocket cut hidden; - Round Collar; - Linning: Cashmere; - Closure with hooks - popper; - Full length sleeves; - Fit: Comfortable; English sizes: 10 UK 12 USA (available: Possible to realize in all size) Measures. Kaschmirmantel mit weibchen zobel weste, den vollen Häuten angefertigt. Wert von markt: 38.000,00 Fur von höchster Qualität, vielseitig und elegant zugleich. 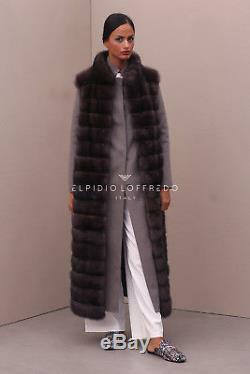 WEITERLESEN: - Höhenmodell: 180 cm (ohne Hügel); - Größe Modell: 40 (italienische Größe); - Farbe: Taupe; - Vertikale Pocket-Schnitt versteckt; - Rundhals; - Futter: Cashmere; - Schluss mit Haken und den popper; - Full-Ärmeln; - Fit: Comfortable; Deutsch größen (EUR sizes): 36 (verfügbar: Möglich, in jeder Größe zu realisieren) Maßnahmen. Manteau de Cashmere avec gilet de zibelline, peaux pleines. Valeur de marché: 38.000,00 Fourrure de qualité, polyvalent et élégant à la temps. SAVOIR EN PLUS: - Modèle Hauteur: 180 cm (pieds nus); - Taille Modèle: 40 (taille italienne); - Couleur: Taupe; - Coupe de poche Vertical caché; - Clôture avec des crochets et popper. Colis Chale; - Doublure: cashmere; - Full longueur manches; - Fit: Comfortable; Taille français: 38 (disponibles: Il peut être mis en oeuvre dans toutes les tailles) Mesures. The item "PELZ PELZMANTEL MANTEL CASHMERE LORO PIANA FUR CHINCHILLA PELLICCIA MEX" is in sale since Thursday, October 12, 2017. This item is in the category "Kleidung & Accessoires\Damenmode\Jacken & Mäntel".